Beer brewing has exploded in growth over the past few years and new breweries are joining the ranks every day. As a result, it’s more difficult to stand out. The U.S. has more than 3,000 breweries producing somewhere around 30,000 unique beer styles vying for attention at any given time. That’s a saturated market with limited marketing dollars, which makes packaging more important than ever. From building a brand identity to choosing cans vs. bottles, we’ve got all the information you need to help your brewery stand out right here. 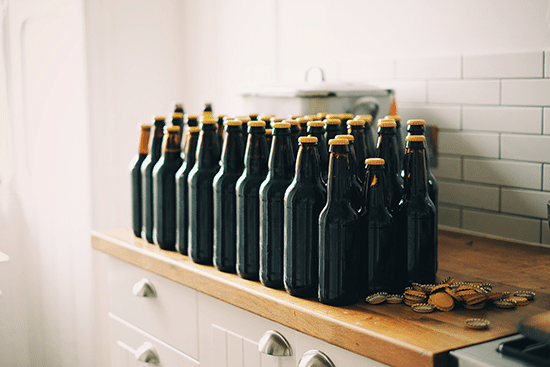 Read on if you’re ready to make your brewery more competitive with great packaging and label design. We’re thirsty for a beer with a good story… Give your market something unique to love about the brand. 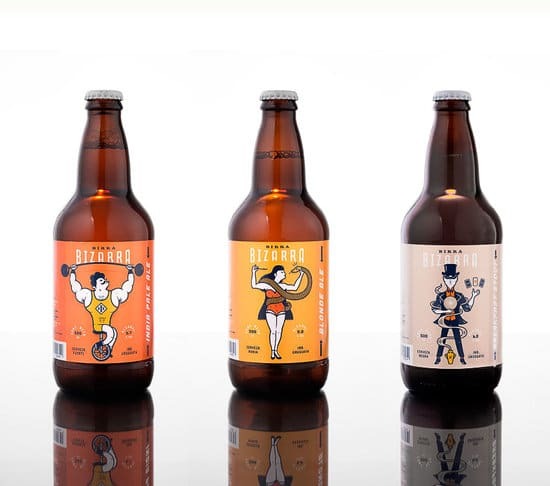 The three designs shown above from Bionic Brew, one of the premier craft breweries in China, are a great example of a consistent branding with a unique story. 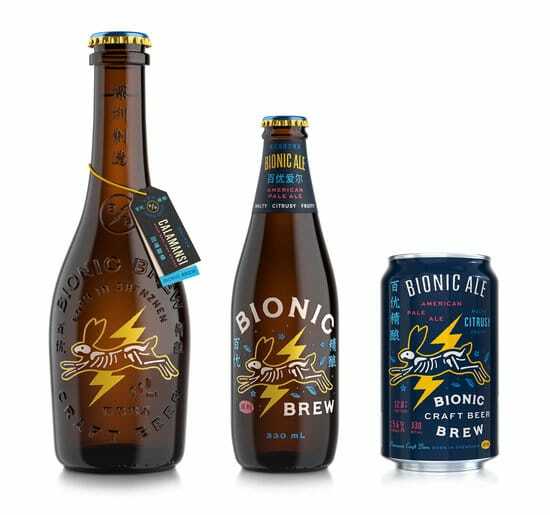 Bionic Brew drew their design inspiration from Chinese folklore. In Chinese folklore, ancient poets tell a story of The Gold Rabbit. Tethered to the moon, the mythical figure spends its days brewing the elixir of life. That care in craft, electrified by the spirit of the Bionic Brew team sparked a powerful symbol for the brand. When you’re determining the story you want to tell, follow Bionic Brew’s example and make sure it’s authentic and genuine to your brewery. Julie Napoli, a marketing professor at Curtin University, recently reported in The Journal of Business Research that consumers see three dimensions to brand authenticity: heritage, sincerity, and commitment to quality. Though it may be hard to measure these dimensions, it is clear that customers want to buy into something more than just a logo. When selecting which beer they want to buy, the one that is able to tell a story or represent a bigger message will have an edge on the competitors. If you are unsure how to build your brand identity, check out our article on the 4 Building Blocks of Brand Identity You Can’t Ignore. How Will You Use Your Design? Once you know your brewery’s brand, you can start to think about the next vital step: where will you be sharing your design message, bottle or can? But, even within these two choices, there are a lot of design variables at play. Bottles offer a lot of design flexibility. All bottles have a label and a cap and may also have a neck band. Each of these elements presents a unique design opportunity. And, your design considerations don’t stop with the words and graphics printed on the label. You’ve got a dizzying array of label materials to choose from; including paper, matte film, glossy film, metalized film, wood finish film or clear film. Each of these communicate a different message to your consumer; so make sure to select a label material that reflects your brand identity. Does matte paper best represent your heritage brand? Could a metallic label best communicate industrial your vibe? Or do you prefer a wood finish that speaks to your dedication to sustainability and nature? 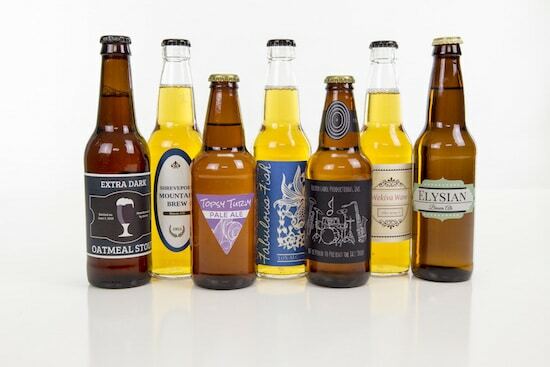 While bottles offer more flexibility, cans offer more design real estate. You’re not limited to a tiny cap, small neck band and a label. You’ve got the entire can to share your design message. Besides the design limitations, many brewers choose cans because of their improved shelf life and reduced costs. And no, cans aren’t just for American lagers anymore. Recently, the craft beer industry has seen a resurgence in cans, earning a 17.2 percent national share of packaged beer sales in 2016 — up from 5.6 percent back in 2013. Half Acre, a Chicago, Illinois brewery (and local favorite of the crowdSPRING team), has been brewing all their craft beer in 16 oz. cans since 2008. So, now you know your brand, you’ve decided whether you’re bottling or canning, you’ve chosen your label material (or lack thereof) and you’re finally ready to create a design! Here are a few pointers to get you started. A strong logo is vital to establishing the visual recognition your brand needs. But what makes for a strong logo? You should aim for your logo to be simple, memorable, timeless, versatile and appropriate. Choose colors that align with your brand identity and evoke the right emotions for your customer. Finally, make sure your logo doesn’t look like anyone else’s. The last thing you want is to have your beer confused with a lesser look-alike. This logo designed by crowdSPRING creative snopy for River Hops Brewing in Fort Dodge, Iowa is both timeless and appropriate. It showcases the brewery’s namesake river and hops in a clean and classy design. Because your logo should be the one consistent graphic element across all of your marketing, it’s worth investing in quality design. Crowdsourced logo design can be a fantastic solution for growing breweries because the process is fast and cost effective. Logo projects on crowdSPRING start at $199 and average over 100 entries. That means you have more options to choose from when trying to find your perfect logo for your brewery. With your logo squared away you can start to think about labels. Your branding, including logo, should remain consistent across all of your labels to establish familiarity and trust. But, each label should be unique to each brew in your line-up. Tell your future customer what’s special about this specific beer. After all, creating your own unique brews is the reason you founded your own brewery to begin with, right? 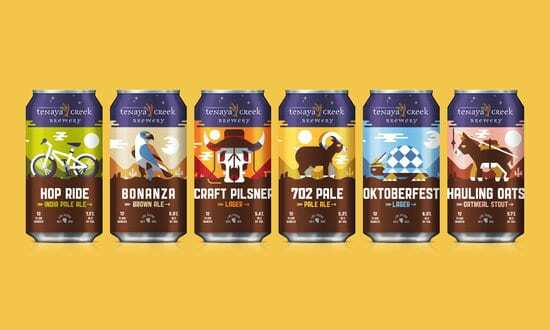 Tenaya Creek Brewery in Las Vegas, Nevada pulled imagery from their Native American heritage to differentiate between each brew. The presence of their navy logo creates a band around the top of each can to ties the designs together while each individual beer has its own unique label design in a distinctive color palette. It makes you want to collect them all! 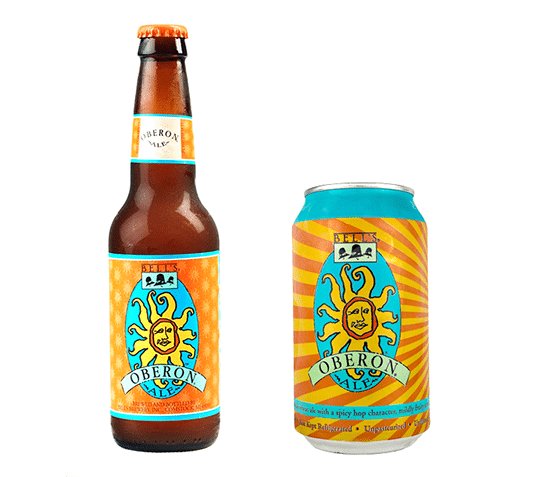 Are you designing for a seasonal brew? Feature images that conjure that season for your consumer. Is it wheaty, hoppy or fruity? Take your inspiration from those. Show your drinkers what they can expect to find inside the bottle. 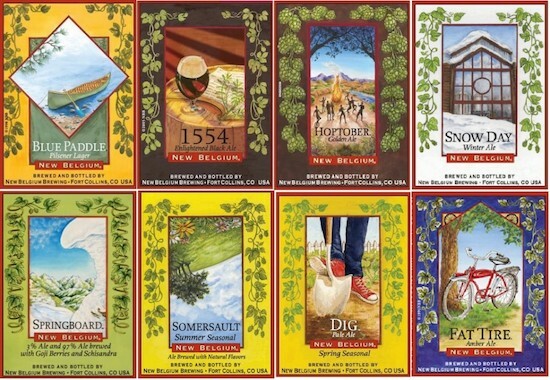 New Belgium in Fort Collins, Colorado takes their customers through all the seasons with label designs that are able to communicate the flavor of the beer and the seasonality of the offering at the same time. What about the beers you offer all year round? This is where your brand identity comes in handy. Use design to showcase your brewery’s unique personality to win your consumer’s attention. Birra Bizarra in Montevideo, Uruguay has channeled their inner sideshow performers with this line of unique labels. Their clean, simple text logo provides an appropriate backdrop for their featured characters and ties the line together nicely. There’s no shortage of personality here. They’re bound to attract a playful, adventurous consumer with these labels. Whether we like to acknowledge it or not, every brewery is participating in a popularity contest. You’re judged by your beer… but only if you get that consumer to buy it first. That means your label is your first impression. Are you quirky and fun or do you take your beer very seriously? Are you innovative and new or steeped in tradition? Show your consumer on your label and you’ll attract like-minded drinkers. The thought of tackling your brewery’s label designs by yourself can be overwhelming. With so many competing breweries, let alone individual beers competing for your consumer’s attention, you need every advantage you can get. Working with professional packaging and graphic designers like our creative community of over 200,000 designers will give your brewery the edge it needs to stand out. And though it may seem more frugal to “homebrew” your design, investing in good design can actually save your brewery money in the long-run. Finally, remember to enjoy the design process. The packaging and label design for your brewery is all about you. Well, your brewery. Use your label designs to tell your story and have fun. Custom craft beer labels really don’t have a set standard. They allow for freedom when it comes to design, and in turn, provide you with freedom for how you want your label to look. So, don’t be afraid to run with it. Make bold design choices that share the soul of your brewery and your beer. If you’re successful with your design choices you’ll be sure to attract the kind of consumer that you’d like to sit down with and share a beer. And that’s what this is all about at the end of the day, right? If you’re ready to step up your brewery’s design game, consider working with crowdSPRING’s community of over 200,000 creatives on a brewery design project. You’ll get dozens of entries and only pay for a design you and your customers will love.